Masters Park is made up of two story town homes and condominiums. The complex backs to Lone Tree Golf Course. It is close to major shopping and amenities. In Lone Tree, Colorado lies a gorgeous arrangement of town homes called Masters Park. Located just off the Lone Tree Parkway, Masters Park is a small complex that has mostly multi-story town homes. These homes vary in size and come in at 1,000 square foot range and some units, including basements can be as large as 3,000 square feet. Masters Park has a prime location in Lone Tree, as there are local amenities nearby. These amenities include the Douglas County Library as well as the Cook Creek swimming area. These are both mainstays for the Masters Park community. The Park Meadows Mall is also a great resource for avid shoppers and there is no shortage of supermarkets from Costco and Sam's Club to Whole Foods. 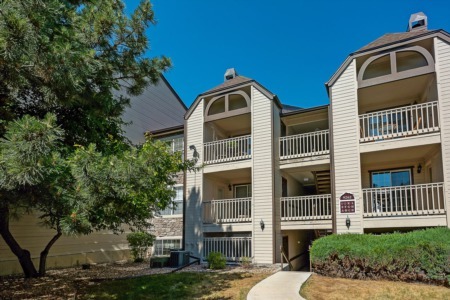 Many of the units here in Masters Park overlook the Lone Tree Golf Course, which serves as a go-to place for golfers and, alternatively, creates a fine view for many of the residents in the area. The Lone Tree Golf Club provides golfers with championship golf.